In 1947, Albert Einstein, a member of the Faculty at the Institute for Advanced Study in Princeton, New Jersey, went to Katherine Stubergh’s waxworks studio in Hollywood, California, to participate in a “live blast.” Stubergh used this term to describe the process—or event—of making a plaster mold directly on a living person’s face. Into this mold a proprietary mixture of wax would be poured in order to create a replica of the person’s head. Stubergh’s habit was to make two heads from a “live blast” mold: one for the person who had commissioned the work and one for herself. Wherever Einstein’s head—the one made for him—ended up, I don’t know, but the Einstein head Stubergh made for herself is now part of an online auction at Skinner, Inc., in Marlborough, Massachusetts. When I heard of this auction, I got pretty excited and began tracing the route the head took to get from Hollywood to Marlborough and, as well, the route one might take from Pelkie to Marlborough. The head’s journey begins in 1969 when Stubergh was raising money to establish a wax museum dedicated to the presidents of the United States. 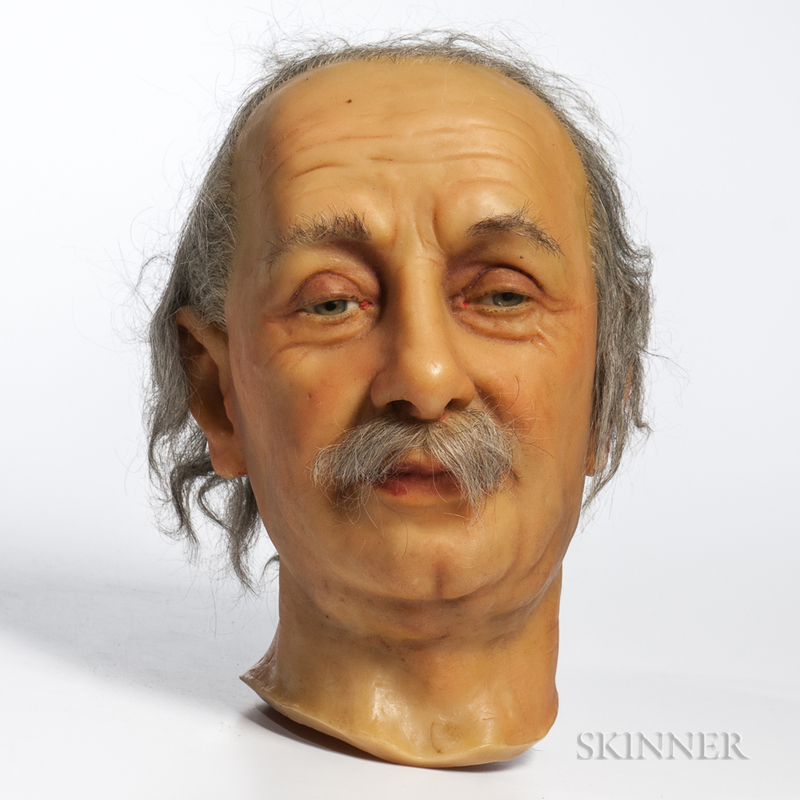 Along with other pieces, she sold Einstein’s head to Herbert A. Moore of Cave City, Kentucky. The head, age 22, was packed in a cardboard box, put on an airplane, flown to the Lexington airport. In Cave City it was put on display at Moore’s Mammoth Cave Wax Museum, sometimes referred to as the Cave City Wax Museum. In 1982, Moore sold the museum, new owners took over, Einstein stayed put. In 2010 or 2011, the museum sold again, this time to an investment company (or somesuch), and the museum closed. 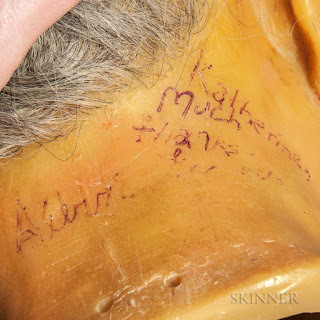 In May of 2012 all of the wax figures, including Einstein’s head, now 65 years old, were put up for sale by auction. 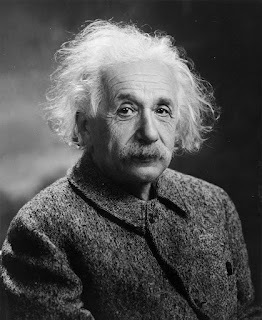 Einstein’s head had a reserve price, that price was not met, and in July the head turned up on eBay. The listing is preserved at Greatest Collectibles, and if you enjoy hyperbole and want more of the story in that format I encourage you to read it. 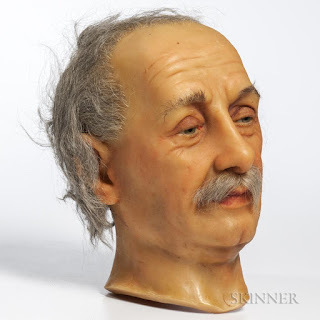 I am satisfied with telling you that after seven days, 14 bidders and 81 bids, Einstein’s head sold for $111,100. But there was a glitch. The winning bidder didn’t have the cash. Enter Preston Evans, an auctioneer from Georgia who had bought many of the wax figures from Mammoth Cave and who had been watching the eBay auction closely. Evans stepped in and proposed a trade. According to an article at Auction Publicity, for Einstein’s head Evans traded “a 1940s-era 4-cylinder motorcycle (worth about $50,000), around 40 vintage trains (including some by Lionel), two Batman arcade games, music boxes and phonographs” and some cash. On the last day of August, 2012, Evans opened Follow the Leader Wax Museum in Warm Springs, Georgia. Einstein’s head went back on display. Less than five years later it was back on the auction block. Now, what is that worth? But after much deliberation and quasi-planning, the mundaneness of bad timing will keep me home. I hold on to the idea, though, that one day I will meet Einstein’s head under circumstances that must remain, only for now, unknown.